After finding the US trailer for the film now Disney has released the UK version. Also they have sent over the UK quad poster that you can also see below. Take out the trash, eat your broccoli—who needs moms, anyway? Nine-year-old Milo (Seth Green) finds out just how much he needs his mom (Joan Cusack) when she’s nabbed by Martians who plan to steal her mom-ness for their own young. 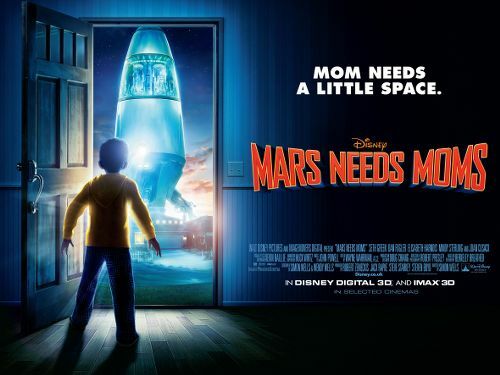 Produced by the team behind “A Christmas Carol” and “The Polar Express,” “Mars Needs Moms” showcases Milo’s quest to save his mom—a wild adventure in 3D that involves stowing away on a spaceship, navigating an elaborate, multi-level planet and taking on the alien nation and their leader (Mindy Sterling). With the help of a tech-savvy, underground earthman named Gribble (Dan Fogler) and a rebel Martian girl called Ki (Elisabeth Harnois), Milo just might find his way back to his mom—in more ways than one.